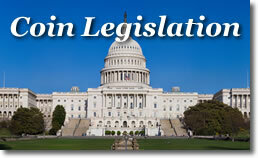 It’s been a brisk couple of weeks for newly introduced or passed coin legislation. Five US coin bills have seen recent movement, and two have actually been presented to President Bush for his signature. Summary of Bill: To require the Secretary of the Treasury to mint silver coins in 2010 to commemorate the centennial of the Boy Scouts of America. Summary of Bill: To require the Secretary of the Treasury to mint silver coins in 2012 to commemorate the legacy of the United States Army Infantry and the establishment of the National Infantry Museum and Soldier Center. 9/26/2008: Referred to the House Committee on Financial Services. 9/18/2008: Referred to the House Committee on Financial Services. 9/9/2008: Read twice and referred to the Committee on Banking, Housing, and Urban Affairs. For any legislation to become law, it must pass both the House and the Senate, and get signed by the President. A detailed listing of coin bills that includes full legislative text and current status may be read on the CoinNews page, Coin Legislation, Acts and Laws.